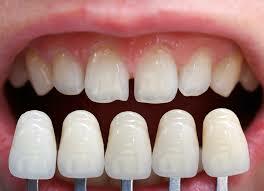 Dental veneers can make your smile bright and beautiful so that you can flaunt it with confidence wherever you go! At Dental Care Of Bryans Road we consider it as our prime duty to deliver you the smile that you have always dreamt of. What are dental veneers really? Dental veneers are a type of restoration that is fabricated in the form of a thin film of material (like composite or porcelain) that resembles tooth color. These are fixed to the front surfaces of the teeth. Slight spacing in between teeth- Minor gaps can easily be corrected with the help of dental veneers instead of resorting to complicated orthodontic treatment. Stained teeth– If you have deep rooted stains on your teeth that cannot be removed by usual professional cleaning, dental veneers can be an apt choice of treatment for you. Fractured tooth– If a blow on your face or an accident has led to the fracture of a small piece of your tooth, dental veneers can conceal the defect and make it appear as normal again. A malaligned tooth- If one tooth does not fall in line with the rest of your teeth and if the defect is minimal the defect can be obscured with dental veneers. How are dental veneers created? The first step to commence any cosmetic procedure is an oral prophylaxis which is the term used to describe professional cleaning of teeth. This way the teeth surfaces are free from any soft or hard deposits. The teeth surfaces are prepared (reduced) mildly so that there is adequate space to accommodate the dental veneers. Now an impression of your prepared teeth is made so that your teeth can be replicated into a model. This model is the base on which your dental veneers are created. When the laboratory work is over, you will be called for the procedure of fixing of dental veneers. An adhesive cement is utilised to fix the dental veneers to your teeth. And now you are ready to click an awesome smile selfie! For the first days, your mouth will be busy getting accustomed to the new appliance fixed to your teeth. As the acclimatization phase is over, you will be comfortable to get along with your new set of dental veneers. During your follow-up visit, which will be planned at least one week after the fixing, you can inform us should you face any discomfort or problem. These temporary issues can be rectified instantly through minor modifications. If a thin film of dental veneers can create a magnificent change in your smile, isn’t it worth giving a try! Contact our office at Bryans Road, MD to learn more about dental veneers.